Dr. Felix is a diagnostic tool that helps Customer Support find the source of technical issues. When should I run Dr. Felix? How do I attach my results? What information does Dr. Felix collect? What if I can't run Dr. Felix or attach results? If you're stuck in a game, you do not need to run Dr. Felix. Please contact customer support and share the title of the game and an explanation of where you're stuck. Select Run or Save File when prompted. If you choose Run, the program will start as soon as it downloads. If you choose to Save, you will have to manually run the program file after it has downloaded to your computer. Once the program starts, it will display the Terms and Conditions. Click Agree, and Dr. Felix will start gathering information. Please note the green progress bar, as it may take a minute or two to finish. When Dr. Felix is finished, click the Close button. A .zip file named DrFelixResults will be created and saved to your desktop. Simply attach the DrFelixResults file to your email to Customer Support. For step-by-step direction, please see the Attach a File to Your Email help article. What kind of information does Dr. Felix collect from my computer? A Windows DxDiag report, which provides information about the computer's hardware. Big Fish Games app (Game Manager) error logs. Trace routes, which test the connection between your system and our servers. This helps troubleshoot connectivity problems. A list of running processes, which help determine if other programs may be interfering with games or downloads. As Dr. Felix gathers the necessary data, it will list every source that it checks. 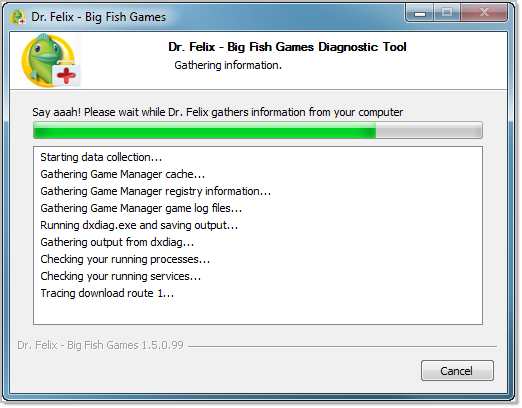 See the first Dr. Felix screenshot in this article for an example of this process. A Dr. Felix report packages together the most helpful technical information. If you're having trouble running the program or attaching the DrFelixResults file, there is other information you can send instead. Running the Windows DirectX diagnostics tool (DxDiag) is another way to create a report about your computer's hardware. Type dxdiag into the text box and click OK to open the DirectX Diagnostic Tool. Attach the saved DxDiag.txt file in a reply to your Customer Support email. For assistance with attaching a file, please see the Attach a File to Your Email help article. If you're unable to attach the file, you can copy and paste the text from the DxDiag results into your email. Open the Start (Windows pearl) menu. Type "dxdiag" and select OK.
Click the button to Save All Information. Select the Search the web and Windows bar next to the Windows start menu and search for "dxdiag". Select the dxdiag Run command. When the Direct X Diagnostic window finishes loading, click Save all information (if there is an option to save a 64 bit report, select that). Since a Dr. Felix report combines results from several tools, it provides much more information than DxDiag or other diagnostics options—especially when it comes to download, activation, and connectivity problems. If you're unable to run Dr. Felix or Dxdiag, or if you're unable to attach their results, that's totally okay. Simply let customer support know in your email. Run the program after it has saved to your Downloads folder. After choosing to Agree, Dr. Felix will start gathering information. Please note the progress bar, as it may take a minute or two to finish. Attach the DrFelixResults.zip file in a reply to your Customer Support email. For assistance with attaching a file, please see the Attach a File to Your Email help article.